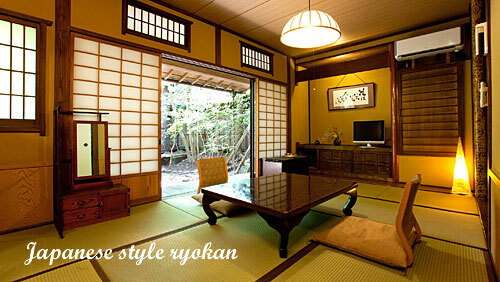 Ryokan serves Japanese style easiness, relaxation, taste and favor. The construction style has changed to the buiding with several stories made of steel bars from traditional buiding made of wood, but the inner construction keeps Japanese style of elegance and simplicity. Once checking in the ryokan, the service lady called nakai-san gives service to the guest with heartful hospitality in the Japanese style room. 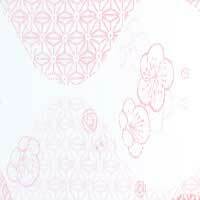 The price ranges from 7000 yen (58 dollars) to 30000 yen (250 dollars) per day, including breakfast and dinner. The checking in is until evening and the checking out is 10 o'clock in the morning. Recently in Japan there have been constructed many kinds of hotels along with the internationalization of culture and economy. One of them is the business hotel which has mainly single room so that business man can easily utilize and has a restaurant on the first floor or the highest floor. The price is reasonable, about 5000 yen to 8000 yen per day, not including meal. City hotel is the same style as the hotel in foreign countries and is located in the center of big city or local city. There are many rooms with deluxe style and are the convention hall, wedding room, shopping arcade in there, so foreigners can use comfortably. According to the service and facility there are A class (over 166 dollars) or B class (below 166 dollars) hotels. 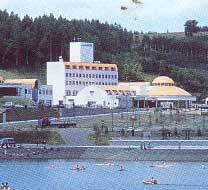 Resort hotel is located on the first class environment such as beach, plateau, lake side, hot spring, etc and is used for sightseeing, relaxation or sport and has larg-space room for a family and a couple. Nearby there are a golf course, yacht harbor or large scale sight spot. Usually the price is teh same as the city hotel, but relatively hogh in some resort hotels.